Come visit the free Kwanzaa Family Festival today, December 26, from 11:00 am to 3:00 pm, at Santa Ana’s Bowers Museum. Celebrate this African-American holiday honoring family, community, and culture. Bring the entire family for music, storytelling, dance, food, and art. Sponsored by the African Cultural Arts Council and the Nicholas Endowment. The museum is located at 2002 N. Main St., in Santa Ana. Click here for more information. And click here to learn more about Kwanzaa. 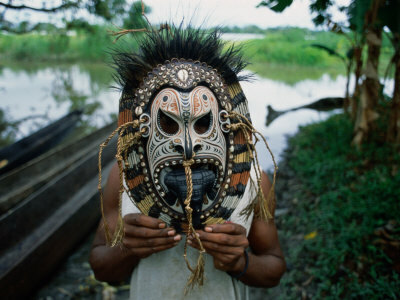 Also, the new “Where Masks Still Dance: New Guinea” exhibit is opening at the Bowers on Saturday, December 2, through June 6, 2010. A stunning presentation of the intricate and mysterious cultures that inhabit the island of New Guinea, home to over one thousand aboriginal tribes and unique languages. Where Masks Still Dance: New Guinea features 40 black-and-white photographs by acclaimed documentary photographer Chris Rainier, known for his revealing images of earth’s last wilderness areas and the isolated indigenous peoples who live there. Explore the lives, masked ceremonies, crocodile cults, rites of passage, adornment, celebrations and rituals rarely documented in the West. Journey into this vanishing world where masks still dance.